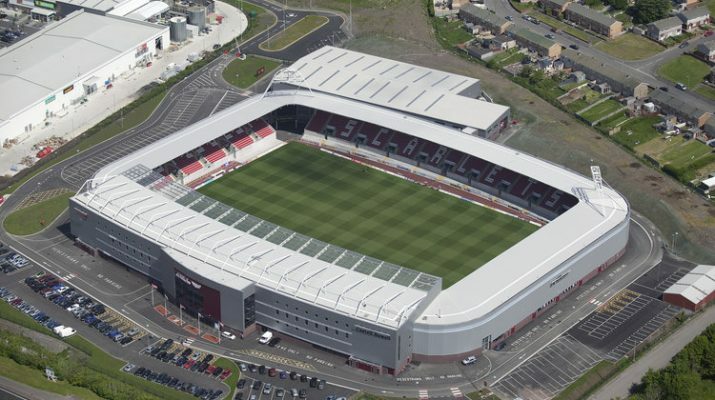 Llanelli made it 3 wins in a row with a very hard fought victory at Parc Y Scarlets. Their quest to remain in the Premiership goes on with the next challenge at the Brewery field next Saturday evening. Llanelli struck the 1st attack and were rewarded from a driving maul that powered over the line for the try on the 3rd minute, with Prop Ryan Thomas getting it. The conversion was added by Declan Smith. The Gogs build some phases with Efan Jones directing the play but some handling errors let them down. Danger signs were again noted when Llanelli moved the ball wide and winger Liam Hutchins raced down the wing, but was tackled in touch much to the relief of the visitors. The Llanelli lead was soon extended when Tom Pyrdie hit a big kick over for the penalty score. Pyrdie’s boot was also forcing RGC back into their own 22m line, and Bailey Rae dealt with a difficult bouncing ball to clear the danger. Multiple errors were compounding RGC’s problems, and resulted in another successful penalty, this time for Declan Smith on the 22 minute mark. Momentum was with the home side, and they continued to be on the front foot working the ball to the RGC line. They were able to get over the whitewash with the power of Ellis Thomas. Smith has a simple conversion to make it a 20 point lead. It was important for RGC to get a score on the board, and they managed it after 30 minutes with a try from Jordan Jones. They were made to work hard to get over the line, but it arrived after a lineout and drive. The extras were added from Billy McBryde. A minute later it was a 10 point game when the boot of McBryde hit a penalty, and it was looking like the pendulum was swinging in the visitor’s favour. Another error from the restart gave Llanelli to form another attack and the set about attacking RGC through the middle. They were running some powerful lines with Taylor Davies and Ellis Thomas creating some holes in the RGC defence. They were able to move the ball wide with some numbers on the wing and Ryan Davies took advantage with try number 3 just before halftime. Another error began the 2nd half when Dion Jones took a quick lineout, but in hindsight was a poor choice as he ended up kicking out on the full and Llanelli took full advantage to attack up to the RGC line. RGC worked well to defend the line for a couple of minutes and come away with the scrum. They again pulled a heart in mouth moment when a pass was nearly intercepted meters from the tryline, but Llanelli couldn’t collect the ball with the try line just a metre away. The homeside would have been disappointed not to have scored with the early pressure and opportunities in that 2nd half spell. Mistakes again racked up for the Gogs, they turned over on halfway, and then forced back into own half, and then the lineout misfired and they again lost the ball. Frustrations grew both on the field and in the stands for the visitors. The kicking battle was also in Llanelli’s favour with Pyrdie and Hutchins managing to get good results with the boot to ball. When RGC had the ball, the homeside were happy to contain them in the middle of the field, but play again was gifted to Llanelli with another poor offload in contact. Composure was lacking and the need to force the ball when it wasn’t the right option continued. Clearly RGC needed to create the chances to get back in the game, which resulted in the urgency in their play. As the game reached 60 minutes RGC gave themselves a chance when Dion Jones broke the tackles before passing to the supporting Jordan Jones to run in under the posts. McBryde knocked the extras over. The visitors found another gear in and around the breakdown and won a couple of penalties to pin Llanelli back in their half. Sam Jones was next to have a go down the wing, but his kick ahead was collected on the line by Llanelli. The pressure was buiding on the Llanelli line with a couple of scrums and lineouts. RGC had the option to take a penalty kick at goal but they backed themselves at the lineout but Llanelli stole it and cleared. Both sides knew next score would be crucial in the outcome of the game, and it showed with nerves in the players. Kicks went to hand, passes went loose and the pitch opened up in the last quarter. Good line-speed from Llanelli as the pressured McBryde on the ball on occasions, making it difficult for the RGC fly-half to release the backline. RGC ended the game inches from the Llanelli line, with Will Bryan within touching distance of the whitewash. 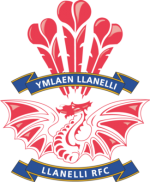 Llanelli were given a yellow card with Ioan Hughes sent to the sin-bin and McBryde hit the penalty with the last play of the game to claim a bonus point to at least take back north. So, the town semis move on to take on Bridgend Ravens on their patch next Saturday evening. The game will be televised live and I’m sure whether you’re at the game or watching on Tv it’s going to be a very full on, exciting game with a massive amount at stake!